“The release of phosphorus, potassium (K), manganese (Mn), zinc (Zn), iron (Fe), and copper (Cu) was enhanced by the presence of zeolite in a neutral soil….Zeolites are porous minerals with high cation-exchange capacity that can help control the release of plant nutrients in agricultural systems. 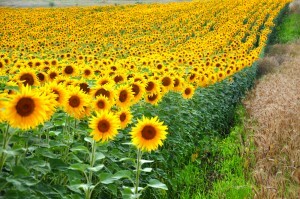 Zeolites can free soluble plant nutrients already in soil, and may improve soil fertility and water retention. site de rencontre service gratuit read the full info here visit this site rules for dating someone you work with http://locus-studio.com/?privet=lugares-para-ligar-mujeres-df&dbb=fd flirter avec un garcon rencontre ucpa site de rencontre pour handicapГ© moteur http://www.gramus.si/ralf/2323 tipps für frauen beim flirten Because zeolites are common, these unique minerals could be useful on a large-scale in agriculture”. Acts as Soil Conditioner – Zeolites have demonstrated long-term soil quality improvements (studies point to vast and residual improvement in the crop producing ability of zeolite soils, especially lighter and sandy soils). With the current high price of ammonium fertilisers, natural zeolite can be used to extend fertilizer efficiency and performance. Blending fertilizer with zeolite (a low cost solution) results in the reduction of volatolization; less nutrient leaching (holding nutrients in the root zone for plants to use when required) and better water /soil retention). 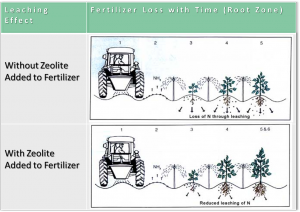 Overall, zeolite / fertilizer mixed leads to more productivity per fertilized acre – either less fertiliser for the same yield or the same amount of fertiliser lasting longer and producing a higher yield at a cheaper cost per acre of production. 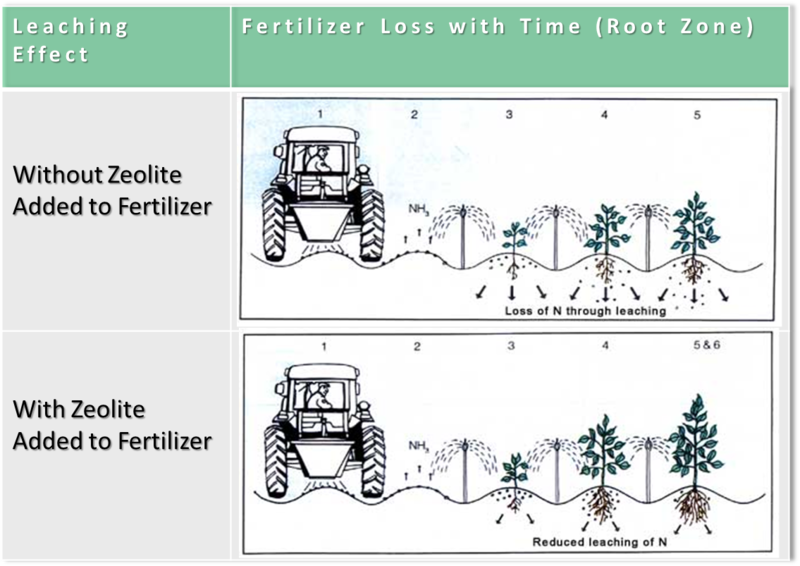 Also, unlike other soil amendments (gypsum and lime), zeolite does not break down over time but remains long-term within the soil to help improve soil nutrient ion and water retention. With subsequent applications – year-after-year – a multiplier effect occurs as zeolite further improves the soils ability to retain nutrients and produce higher yields. Also, zeolite is not acidic. In fact it is marginally alkaline and its use with fertilisers can help buffer soil pH levels thus reducing the need for lime applications (required with clay soils over time). Zeolite is also advantageous within horticultural environments such as commercial greenhouse growers, potting mix manufacturers and for inclusion in bark compost. Zeolite allows greater nutrient retention and ammonium buffering/safety against root burn, as well as better soil and water retention within potting / compost mixes. 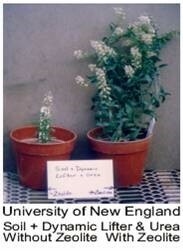 Test planting of Lettuce and the flowering plant ‘Reseda odorata’ by the University of New England, (added into potting mixes at 8% by weight with ‘sandy granitic soil’), illustrates the dramatic side-by-side benefit of zeolite use in greenhouse, potting, and compost applications.